The Chocolate Muffin Tree: Create and Learn: My First E-book! I'm so excited to share with you some exciting news! My first E-book came out this past week! 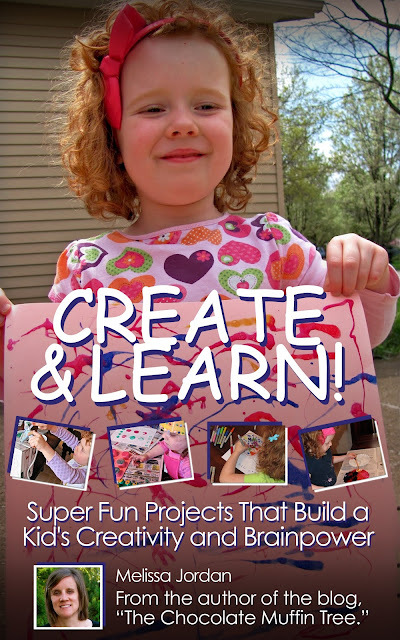 I've been working with the wonderful people at Demand Media the past few months to produce my book: Create and Learn! Super Fun Projects That Build a Kid's Creativity and Brainpower. It is 86 pages full of Chocolate Muffin Tree inspiration to be more creative with your children and at the same time creating special memories together. It has been a lot of work writing this book, while teaching High School Art full time, creating blog posts, and taking care of my family. I am so proud that I was able to accomplish this book. If someone would have told me two years ago when starting this blog that I would have an E-book based on The Chocolate Muffin Tree, I would have never believed them. I am overjoyed that it has become a reality! Hooray for me! Congrats and your tutorials are a real treasure for parents and their kids :) Keep it up! Thanks so much for your positive feedback. Your comment really made my day! This is SO exciting! Congratulations Melissa! Thanks so much Ness. It has definitely been an exciting adventure to write and now to promote!